Concrete, glass and steel constructions are the most common materials that we can see in the modern architecture of today. We can also see how the designers connect the environment to its house building to create a more appealing and environmental friendly design. 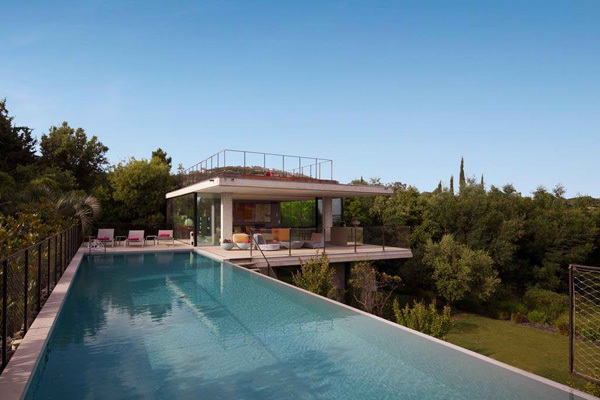 Today, we will share to you a private house designed for the family in South Eastern France. We will witness how the designer makes the most of the environment as well as the existing materials to have a modern private home for the entire family. This house is called Private House which is specifically located in Beauvallon, a commune in the Drôme department in South Eastern France. 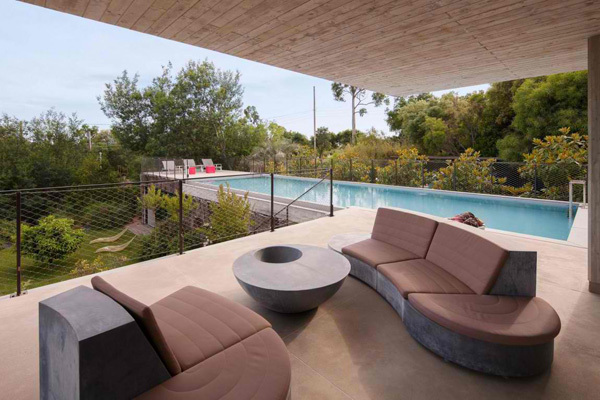 The house design is parallel to its natural topographical setting. The maximum height of the elevation reaches just above the treetops that influenced the resident’s ideas to be surrounded with wildlife views. 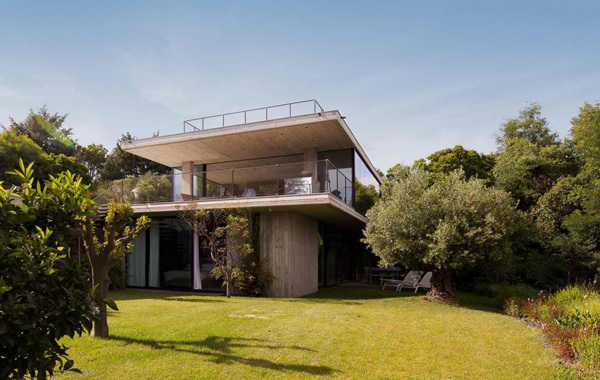 This contemporary home is made up of concrete, glass and steel construction utilized to have a transparent and movable glass walls. Let us see more of the different areas of the house through the images below. 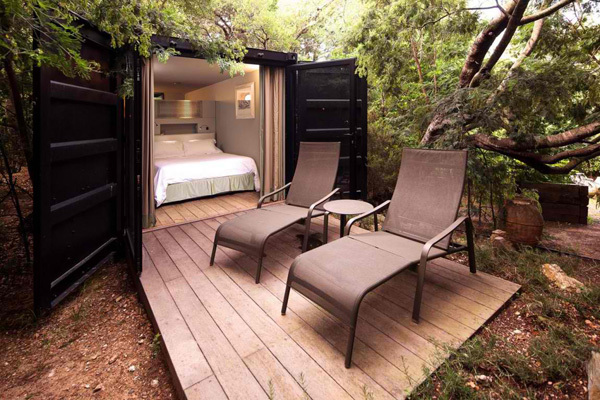 Secluded place like this may surely be achieve in the heart of tall trees and rich green plants. 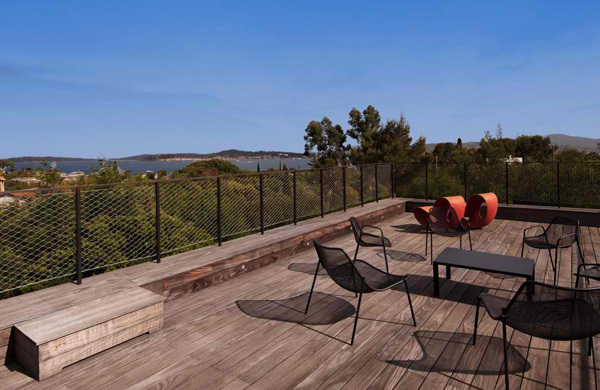 Stainless and rare style of chairs are set in the terrace that creates a relaxing area in the house while enjoying the wildlife views. Colorful palette in the living space are accomplished with the trendy furniture and accessories that made this area livelier. 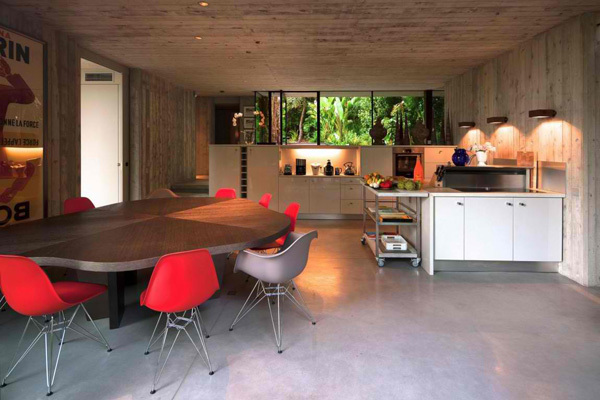 Here’s the extraordinary shape of the dining table that is really perfect for the modern red chairs that surrounded it. 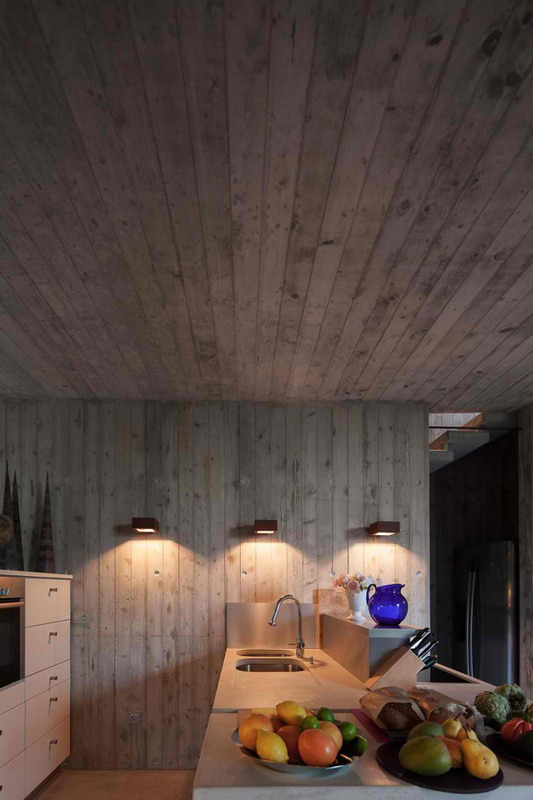 Three LED lights in the kitchen sink accentuate its modern and wooden design that made this area more cozy and comfortable. 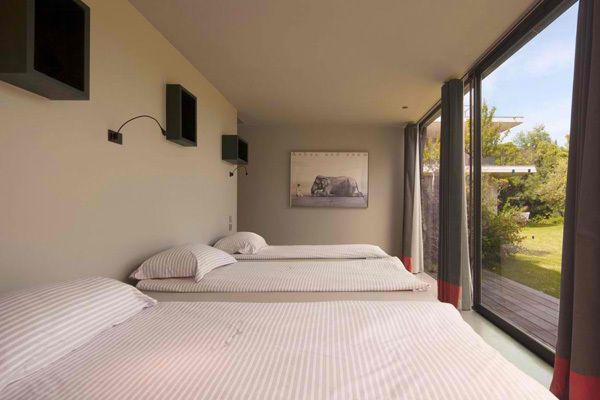 Bedroom for three individuals in the family is graced with floor-to-ceilings glassed windows and sliding doors. 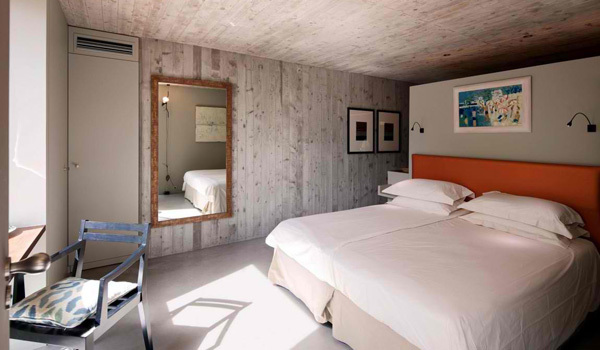 Another bedroom for two is perfect for the guest of the family who may spend weekend or vacation in their house. Fresh colors available in the garden can be accessible through the glassed windows and open doors in the bedroom. 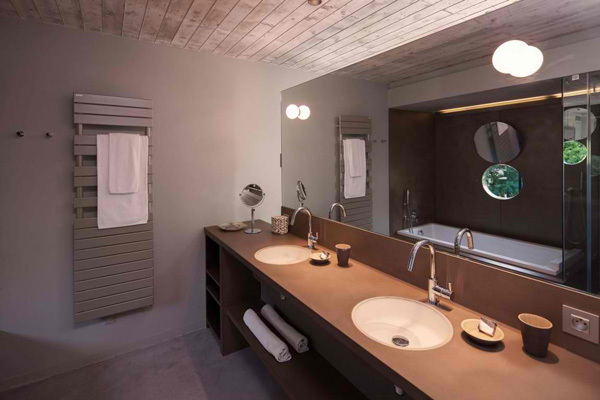 Traditional huge mirror in the powder area create a charming bathroom. 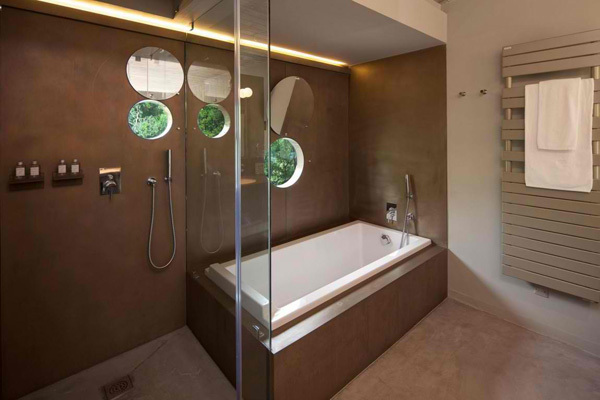 Glass material used as a frame divided the bath tub and shower area but made this bathroom spacious. 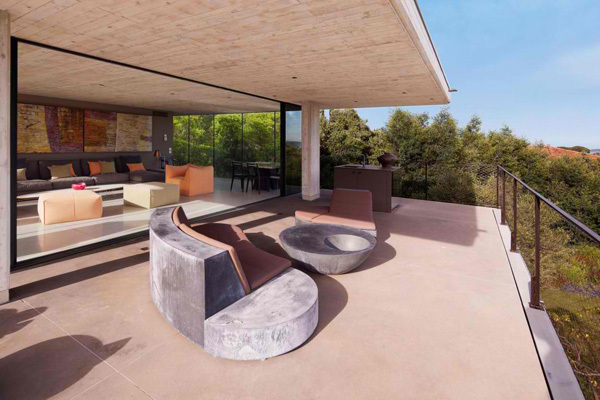 Here are the two chairs set perfectly in the outdoor that is also accessible from the bedroom that may provide the client the natural ventilation he wants. 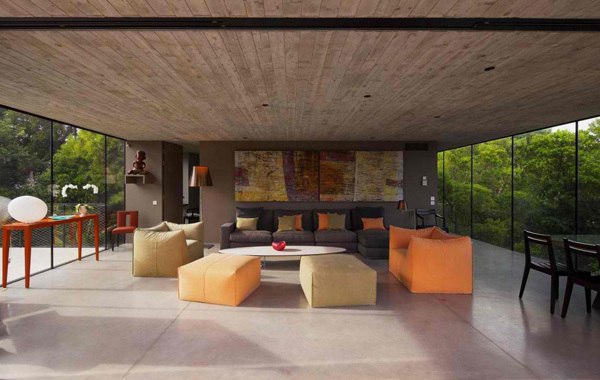 Rough and smooth texture presented from the ceilings to the concrete furniture is well-displayed in the exterior. Rectangular swimming pool is installed in the outdoor area to add luxury and provide a more comfortable experience to the homeowner. 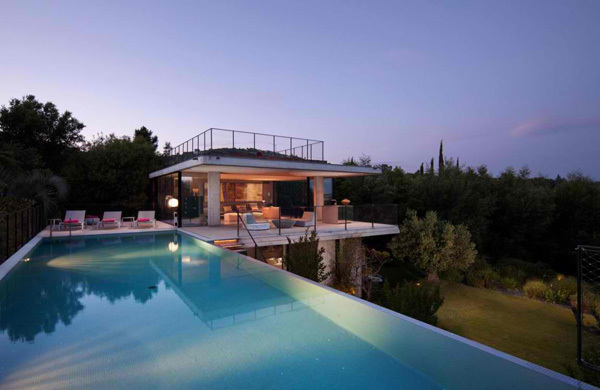 For this long and rectangular shape of the swimming pool creates not just a lovely look but a horizon views from the interior. Pool lights installed in the outdoor at night is very effective to have a special and awesome space for the entire family. Vivid lights in the interior uncover the promising and elegant ideas that may underscore its charm and transparency schemes. I am inspired how the designer made use of the concrete, steel and glass materials to come up with a transparent and moveable glass walls. I like how it further blurs the concept of what you can see in the interior and the volume of the exterior. This allows the open indoor spaces to skillfully merge with the external spaces. These walls in the house can allow access for natural light and even can take the full advantage of the cross ventilation. As a whole, I can say that this house is really amazingly and cleverly made and conceptualized by the Bumper Investments. We are hoping that we have given you another set of ideas through the character and qualities of this house design.